Frae upper left: Auld centre o Recife; Recife an its bridges; Aereal View o Boa Viagem Beach; Boa Viagem Beach; The Crystal Touer; Capibaribe River; The neighborhuid o Boa Viagem; Agamenon Magalhães Avenue; Recife Sunset. Recife (Portuguese pronunciation: [ʁeˈsifi] ( listen), heh-see-fee) is the fift-lairgest metropolitan aurie in Brazil wi 3,743,854 indwallers, the lairgest metropolitan aurie o the North/Northeast Regions, the 5t-lairgest metropolitan influence aurie in Brazil, an the caipital an lairgest ceety o the state o Pernambuco. The population o the ceety proper wis 1,555,039 in 2012. Recife is locatit whaur the Beberibe River meets the Capibaribe River tae flaw intae the Atlantic Ocean. It is a major port on the Atlantic Ocean. Its name is an allusion tae the coral reefs that are present bi the ceety's shores. The mony rivers, smaa islands an ower 50 brigs foond in Recife ceety centre characterize its geografie an gies it the moniker o the "Brazilian Venice." The Metropolitan Region o Recife is the main industrial zone o the State o Pernambuco; maist relevant products are those derived frae cane (succar an ethanol), electronics, fuid, an ithers; thanks tae the fiscal incentives o govrenment, mony industrial enterprises wur stairtit in the 1970s an 1980s. Recife haes a tradeetion o bein the maist important commercial centre o the North/Northeastern region o Brazil wi mair nor 52,500 business enterprises in Recife itself plus 32,500 in the Metro Aurie which tots mair nor 85,000. 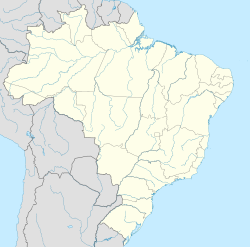 A combination o a lairge supply o labor an signeeficant private investments turned Recife intae Brazil's seicont lairgest medical centre (seicont anly tae São Paulo); modren hospitals wi state-o-the-airt equipment receive patients frae several neighborin States. Lik aw ither ceeties in the Northeast, Recife is developin its tourist sector. The beach o Porto de Galinhas, 60 kilometers (37 mi) sooth o the ceety, haes been repeatitly awairdit the title o baist beach in Brazil an haes drawn mony tourists. Recife's infrastructur is amang the maist developed in Brazil for travellers an business fowk, tho thare is wide room for improvement. The ceety is an aa a renowned eddicational centre, an home tae the Federal Varsity o Pernambuco, the lairgest varsity in Pernambuco. Several Brazilian historical figures, sic as the poet an abolitionist Castro Alves, moved tae Recife tae attain thair eddication. Thegither wi Natal thir are the anly Brazilian ceeties wi direct flichts tae the islands o Fernando de Noronha, Warld Heritage Steid syne 2001. Due tae the ceety's proximity tae the equator, Recife wather is generally warm. Recife haes a nummer o islands, rivers, watterwyes an brigs that crisscross the ceety. Recife is locatit amidst tropical forests which are distinguished bi heich rainfaw levels resultin in poor soil quality as the rainfall washes away the nutrients. Thare is an absence o extreme temperatures an a cuil breeze due tae the tred winds frae the Atlantic Ocean. Recife haes a tropical forest. Rainforests are characterized bi heich rainfall, wi definitions settin minimum normal annual rainfaw atween 2,000 millimetres (79 in) an 1,700 millimetres (67 in). The soil can be poor acause heich rainfall tends tae leach oot soluble nutrients. Thare are several common characteristics o tropical rainforest trees. The ceety o Recife is fairmed bi three islands (Recife, Santo Antônio, an Boa Vista). Atween the islands are the rivers Beberibe an Capibaribe. Capibaribe, Beberibe, Jiquiá, Tejipió, Jordão an Pina. Recife haes a year-roond tropical climate, wi warm tae het temperaturs an heich relative humidity throughout the year. Houever, thir conditions are relieved bi pleasant tred winds blowin in frae the ocean. Unner the Köppen climate classification, the ceety featurs a tropical monsoon climate. Januar is the warmest month, wi mean temperatures rangin frae 31 °C (88 °F) tae 22 °C (72 °F), wi sun; Julie experiences the cuilest temperatures, wi mean temperatures rangin frae 27 °C (81 °F) tae 20 °C (68 °F), wi rain. Juin is the wettest month an the seicont-cloudiest, receivin an average o 390 mm (15.4 in) o precipitation, an surpassed in cloudiness anly bi August. Indeed, August is incredibly cloudy in Recife, wi a mere daily average o 3.5 oors o sunshine throughoot the month. The driest an sunniest month is November, whan maximum temperatures hover aroond 30 °C an an average o 48 mm (1.9 in) o precipitation is recordit. November is an aa Recife's anly true dry saison month, as aw ither months in the ceety are wet saison months. Junior Assuncao, mixed martial airtist. Jaqueline Carvalho, Professional Volleybaw Player. Manuel Bandeira, poet an writer. Francisco Brennand, sculptor, painter an ceramist. Romero Britto, Sculptor an painter. Josué de Castro, humanist an writer. Nelson Ferreira, componer an muisicker. Paulo Freire, eddicator, poet an writer. Gilberto Freyre, sociologist, poet an writer. Joaquim Nabuco, writer, jurnalist an diplomat. João Cabral de Melo Neto, poet an writer. Nelson Rodrigues, poet an writer. Mário Schenberg, electrical engineer, pheesicist, airt critic an writer. Walter Wanderley, organist an pianist. Spain A Coruña Galicia ? ↑ "Weatherbase: Historical Weather for Recife". July 2011. ↑ "Mayor's International Council Sister Cities Program". Recife, Pernambuco. Retrieved 2008-08-18. This page wis last eeditit on 3 Mairch 2019, at 20:51.